(Akron, OH) – We have brewed a really tasty Chocolate Martini Imperial Stout (!) as a collaboration with dark beer experts Lervig Brewery in NORWAY!! This was the 2nd. 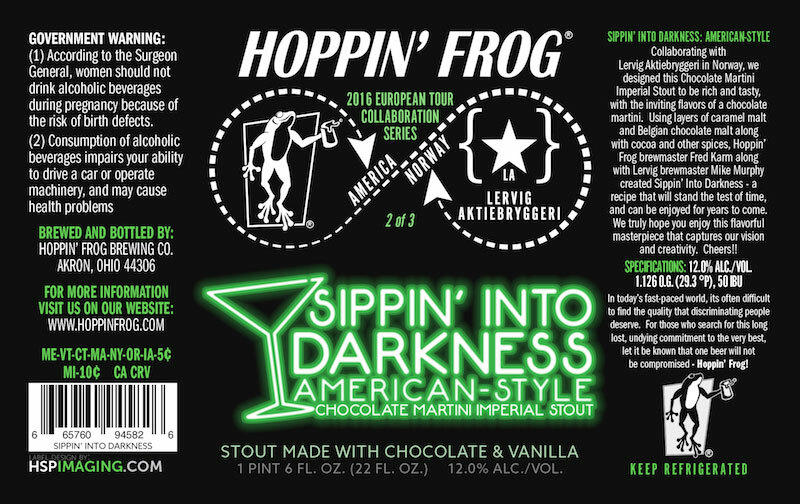 of 3 great collaboration brews we made in Europe this year, and then came back and brewed it here at Hoppin’ Frog. It was a great match-up of skill making this dark specialty brew together, which clocks-in at a whopping 12% abv! Check-out this cool video I shot of us brewing this crazy, inventive beer we named Sippin’ Into Darkness, at their big 200 HL brewery in Norway. This recipe smelled so good when it was brewing, and was so fun to make, that we couldn’t wait to brew it at Hoppin’ Frog too!! And now our version, Sippin’ Into Darkness: American-Style will be released on Saturday October 15th in our Tasting Room starting at 11 am. It will be available on-tap, and to-go in our signature 22-ounce bottles for $10.99. There is a 2-case limit on this rare, limited-edition collaboration brew, and 10% mixed-case discounts are available in the Tasting Room while supplies last!. Inspired by the super-tasty Chocolate Martini cocktail, we added lots of chocolate, and just a little vanilla,- which together create the base for a great Chocolate Martini flavor. Then, we added a little milk sugar for an appropriate, creamy taste, to round-out all the flavors from our infamous cocktail. We used tons of great ingredients, including an over-abundance of the finest cocoa nibs from Ecuador, for an amazing flavor. We know you’ll enjoy this inventive collaboration brew as much as we do! !